I arrived to Siem Reap, Cambodia in the evening - I had planned to meet up with a travel buddy, Connie from Austria - she was part of the group that I met in Laos, and we had done Luang Prabang and Vang Vieng (crazy tubing party time) together. She had headed to Cambodia while I was in Vietnam, but it turned out our schedules aligned perfectly to meet up in Siem Reap! So from here on out, you can note I'm talking about her when I say Connie, and not cutesily referring to myself in the third person. Siem Reap is a city in Northwest Cambodia; best known for being the base to the famous Angkor Wat temples! Angkor and its temples were the seat of the Khmer empire between the 9th and 15th centuries. It was the largest pre-industrial city in the entire world, and an incredible testament to the power, intricacies, and ability of the Khmer people. 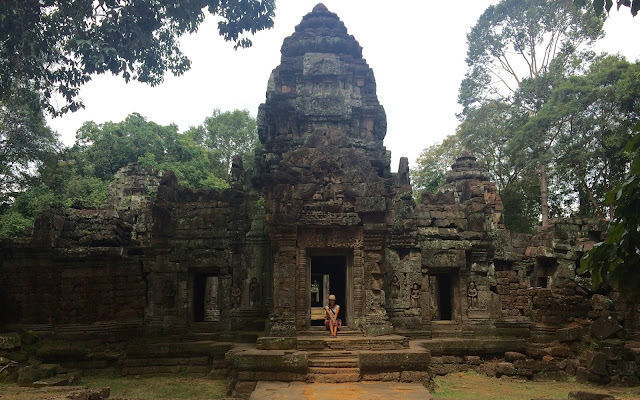 These temples are totally insane - there are a ton of them (it was estimated the city of Angkor had 1 million people - a huge deal for that period of time) and the insane, amazing detail and sheer scale/size of them will take your breath away. It's one of those world amazing wonders. Oh, and a World Heritage Site. The most amazing thing is that these temples weren't destroyed by the Khmer Rouge when they were on their destroy-every-single-temple-and-building mission. Angkor was a source of pride of the power of the Khmer empire, so it was extremely lucky that these were left untouched. Connie and I had coordinated to book the same hostel, so we met up in the hostel lobby. Next AM, we hired a tuk-tuk driver to start exploring some of the temples around Angkor. First up, Prasat Preah Khan! Look at all the mini-Buddhas above the doorway! Third temple - Prasat Ta Som. These temples were all built by the Khmer kings back in the day. Next up (I fully realize nobody cares about these temple names but me - I wrote them all down for my own nerdy reference) was East Mebon - built in the 10th century and dedicated to the Hindu god Shiva. Last on our exhaustive temple-tour was the Ta Phohm Temple; a.k.a. the Tomb Raider temple - given this is where Angelina Jolie filmed a bunch of the movie Tomb Raider. This one is also well-known because it is a prime example of a temple where the trees have taken over the temple. Thoroughly templed-out (it's a real term here in SE Asia), Connie and I headed to lunch (noms), and decided to take it easy in the afternoon. Connie mentioned she'd heard from another traveller that you can donate blood at some of the hospitals, which I'd read as well in a travel guide and had wanted to do also! 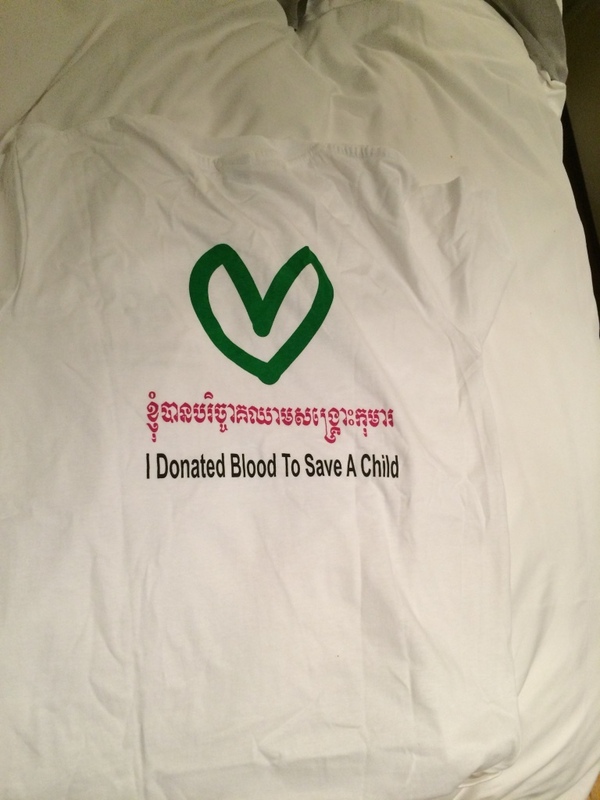 Apparently there's something in Cambodian culture that makes people super hesitant to donate blood - therefore there is a big shortage of blood. There is a children's hospital in Siem Riep called the Angkor Hospital for Children - there was a big sign outside saying they really needed blood donations, especially the rarer AB and B types (and I'm B+! Beeeee positive!). Also, Connie is a doctor so I thoroughly felt better having her there doing it all with me. Walking through the children's hospital. They see about 400-500 patients per DAY. And then they gave me this adorable shirt! Cambodia uses dollars! Imagine my confusion when I arrived at the bus station and hunted down an ATM, only to find that it would only dispense dollars. There is a local Cambodian currency called the Riel, but apparently the dollar is much preferred. If something is $1.50 and you pay with dollar bills, you get the change in Cambodian Riel. Otherwise, dollars are king. Most confusing ever.